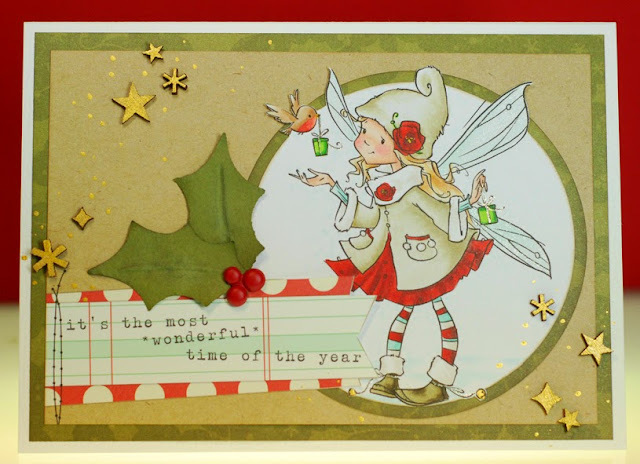 You'll love the cards that my fellow CCD teamies have made to share with you today over on the CCD blog. As always, there are chances to win the new stamps while you are there so don't miss that! 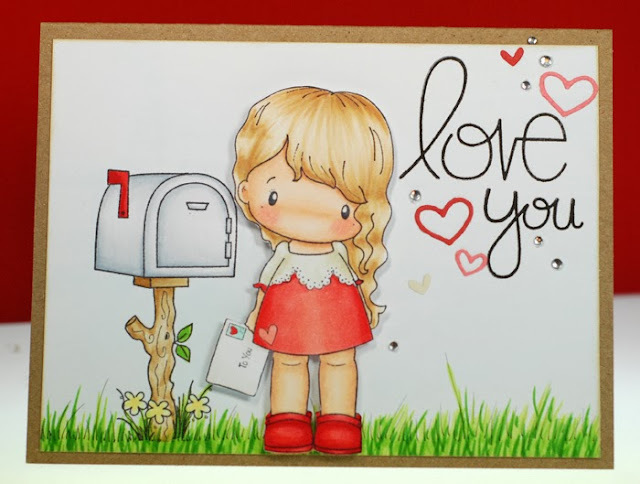 Love Letter Lucy along with the other January stamps and dies will be available for purchase at the CC Designs store Thursday, January 2nd at 9am EST. The rest of the CCD team have more loverly preview cards to share with you over on the CCD blog today. As always, there are chances to win the new stamps while you are there so don't miss that! 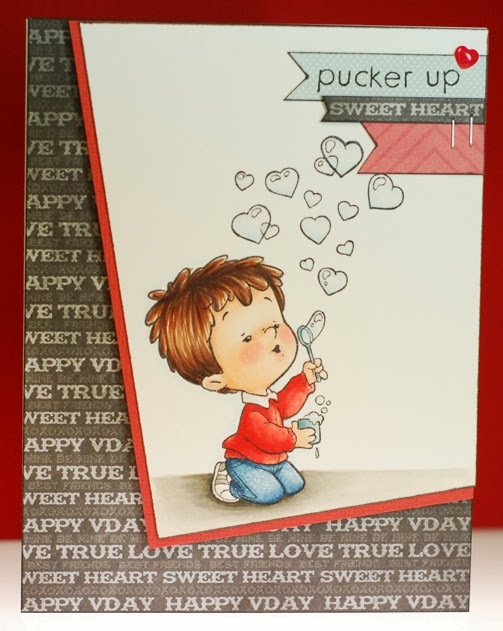 Blowing Kisses Henry along with the other January stamps and dies will be available for purchase at the CC Designs store Thursday, January 2nd at 9am EST. With all of the holiday hoopla going on I haven't made any cards these past few days but I remembered that I had this birthday card that hadn't been shared yet. I made this for a friend who has an early December birthday and she loves the Creeper Crew girlies from TGF. So I inked up Friday Night Creeper and did my best to make her into a mini me of my pal. The overall design is pretty CAS, but that paper had all the color and energy going on that I wanted for this birthday message so I didn't mess too much with it. I'm going to keep this post short and sweet as I know the Christmas rush is on in my neck of the woods and I'm sure it is the same for all of you as well. 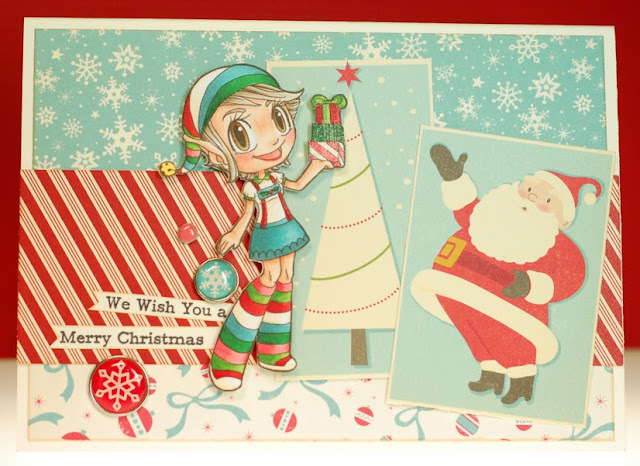 So this is just a quick Christmas card using the ever adorable Happy Day Wrynn from Tiddly Inks. 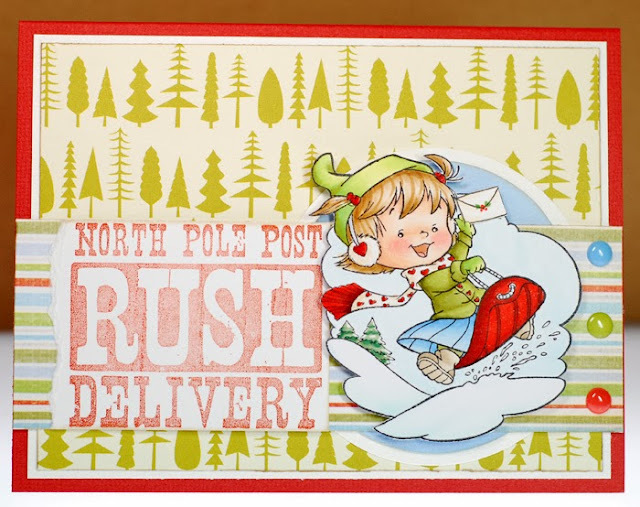 I'm pretty sure this stamp set is intended more for birthday cards but with the right palette of Christmas colors it wasn't hard to make Wrynn look like she is bringing an armful of gifts to a Christmas party. I've had this idea of altering Xmas Sweeties Ian boppin' around in my head for for a few weeks now and figured that the current Christmas Wish FFF challenge was the incentive I needed to finally give it a go. I wanted to make Ian into a real Santa so I drew him a little beard and glued it right on. As far as stamp altering goes this was a super easy one to do and I think he makes for a super cute Santa Claus. Alrighty, I gotta scoot... lots to do today. Well, thanks for stopping by and I'll catch ya tomorrow! 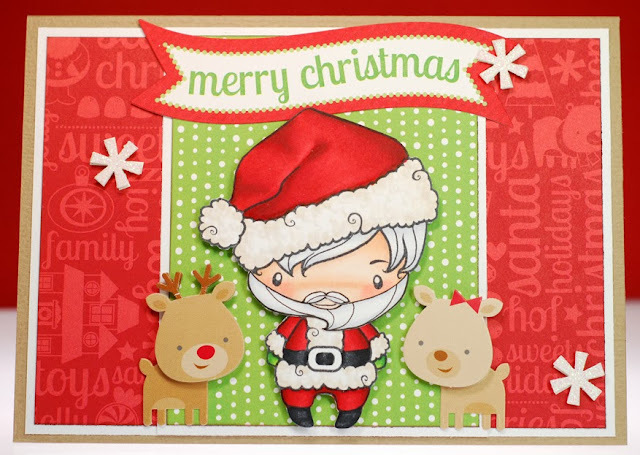 I also got a card done yesterday using the Snowball Laugh stamp from CC Designs. I still love these little Laugh cuties and am sad that there haven't been any new ones added in awhile. But I couldn't resist inking up Snowball one more time and pairing her with these great Sweet Water papers. Sweet Water is one of the very first paper companies that I remember buying when I started scrapbooking back in '02. In fact, I'm sure I still have some of the old 8.5x11 sheets that they made in the beginning. Then they quit producing paper products a few years back and I was totally bummed so imagine my excitement when they teamed up with Bazzill recently. Happy days are here again, LOL! Anywho, it was a blast working with their fab papers again. Well, I'm off to work... enjoy your Friday! Ok folks, we are officially less than ten days away from Christmas... what?! As a card maker I almost don't want to admit that at the top of my to-do list today is take Christmas cards to the post office for mailing. Yes, I am hanging my head in shame... shame I tell ya! Now all I can do is hope that the postal service isn't so busy that my cards get held up and arrive even later. Oy! In the meantime, I'm going to keep plugging away on Christmas cards. Even if they don't get used this year it is nice to have a bit of a stash to start the next year with. 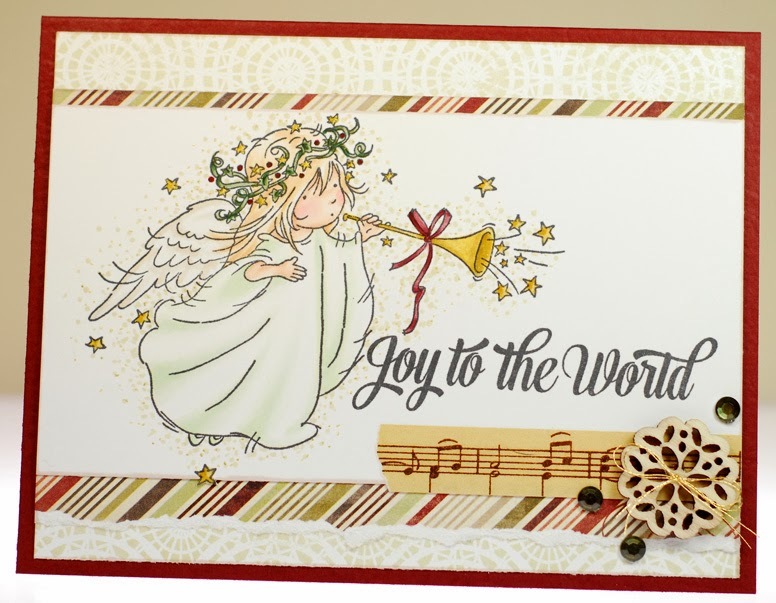 Today's card features the Little Trumpet stamp from Lili of the Valley and scraps from my Christmas scrap bag. The rest are just a bunch of bits and baubs that were floating around my cluttered desk. Because I was using only things that were close at hand this card actually came together pretty quickly, which is always a good thing. So I snagged this cute snowman stamp from MFT last week along with this sheet of paper by Echo Park and I think they are a match made in stamping heaven. Growing up with birch trees in the yard has left me with a nostalgic soft spot for anything with a birch print pattern on it. As for this Happy Heart Snowman, I wanted to try creating the look of a knit pillow with that heart he is holding. It didn't turn out as great as I had hoped it would but it did give me an idea of what I need to do the next time I try this technique. Even after all this time it still comes down to practice, practice, practice! Ok, time for some cocoa and then off to work. I've got a bunch of errands to run today and people to visit so I'm going to keep this post short and sweet. Ok then, thanks for stopping by and enjoy your Sunday! 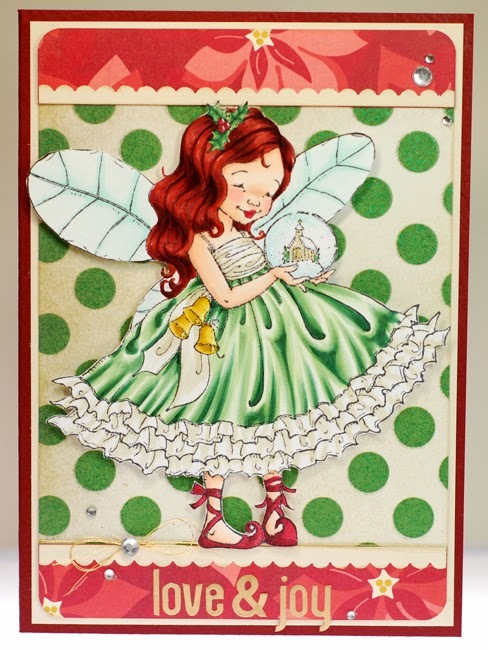 So my card today features an oldie but goodie stamp from CC Designs. 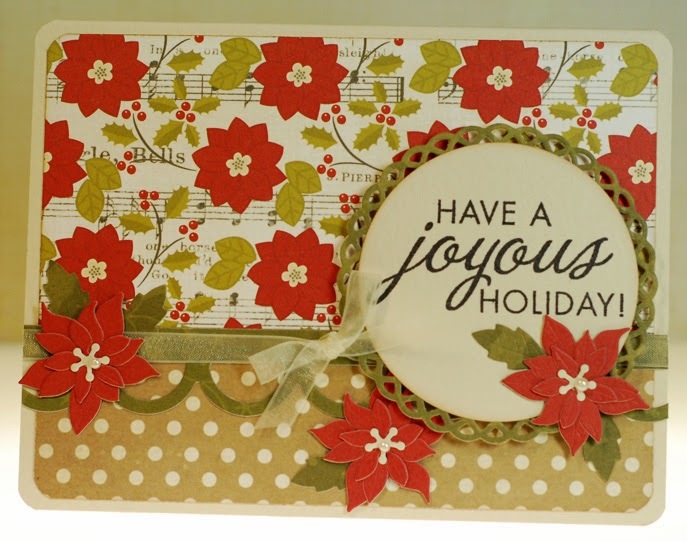 I used Trim the Tree Sugarplum (who I can only find in digi now) to make a simple and sweet holiday card. I paired her up with some of this year's Jillibean Soup Christmas collection, the pretty pinks and aquas added to the traditional Christmas color mix just makes me happy. I've been so focused on using more of my newer stamps lately but it was nice to revisit an old friend. Alrighty, time for me to go get started with the day. I recently got the new Winter Wonderland digis from Sugar Nellie and couldn't wait to color them up. First one to get on a card was this sweet On the Wings of Love image. Isn't she just totes adorbs? Totes mcgoats, she's cray cray adorbs! LOL, if you haven't seen the Sprint commercials featuring James Earl Jones and Malcolm McDowell you might not get that last reference... I swear those commercials crack me up every time I see one. Thanks for stopping by and I'll catch ya on the flip side! Bet'cha thought I had frozen into an ice statue what with being MIA these past few days. While it is still feeling very sub-Arctic out there I've managed to stay fairly warm and cozy though I'm currently a bit under the weather... bleh. Luckily I've got a couple days off to try and kick this thing. Well, I'm going to go take some Dayquil and see how the day goes. 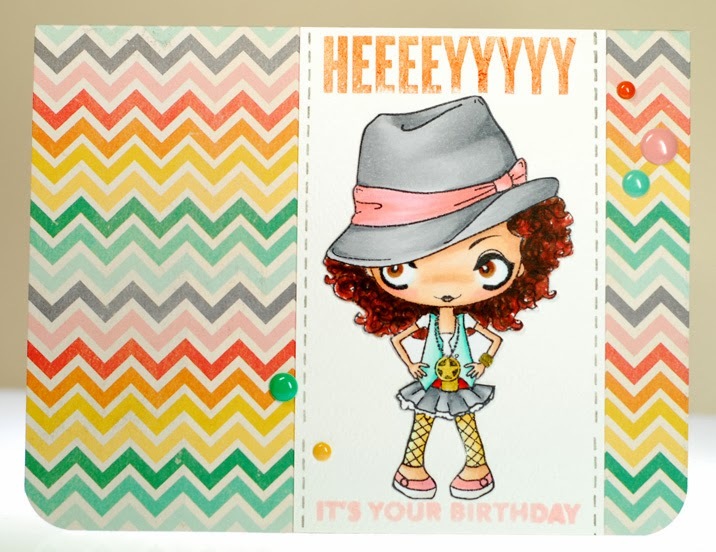 I got a card made for this week's Farm Fresh Friday challenge over at The Greeting Farm, which is All That Sparkles. I hadn't inked up this Anya Strolls stamp yet and there is a part of me that really enjoys altering them a bit to work with that bag stamp from the Dress Me Anya set. So I wiped away the leash and the pup then re-drew in the missing part of her leg. Her hand positions were perfect for a few festive shopping bags and I even added a bit of tissue paper to them for a fun finishing touch. 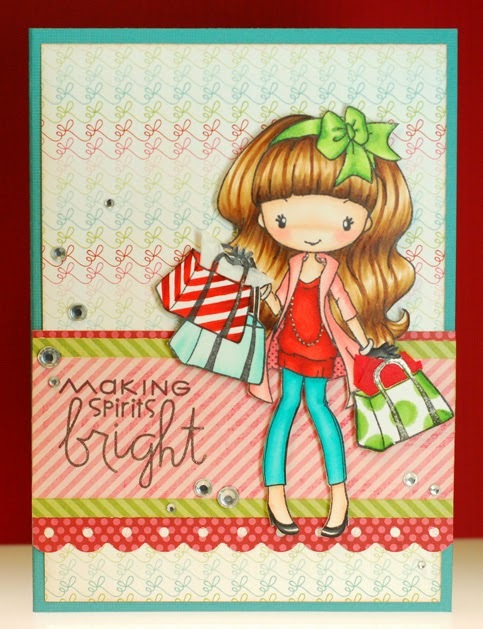 I added sparkle to her bags and outfit with a Stardust glitter pen and topped the card off with a sprinkling of bling to really hit home with the challenge. All in all I really enjoyed putting this card together and it makes me want to see some new Big Time Anyas joining the TGF family sooner rather than later... fingers crossed! Ok, I might have to go hop back under the covers for a bit to really warm up. Hope you all are managing to stay warm and toasty. Okey dokey, I'm off to get this day under way. Thanks for stopping by! Alright, time to get myself ready for work. Today my card features a new Swiss Pixie stamp from CC Designs called Pocket Birgitta. This lovely little lady is dressed in her finest winter coat and is ready to spend the day enjoying the holiday atmosphere in all the stores around town. Everywhere she goes the signs of the season greet her and Birgitta lets that Christmas spirit fill her to the brim. My fellow CCD teamies have gorgeous preview cards to share with you over on the CCD blog today. As always, there are chances to win the new stamps while you are there so don't miss that! 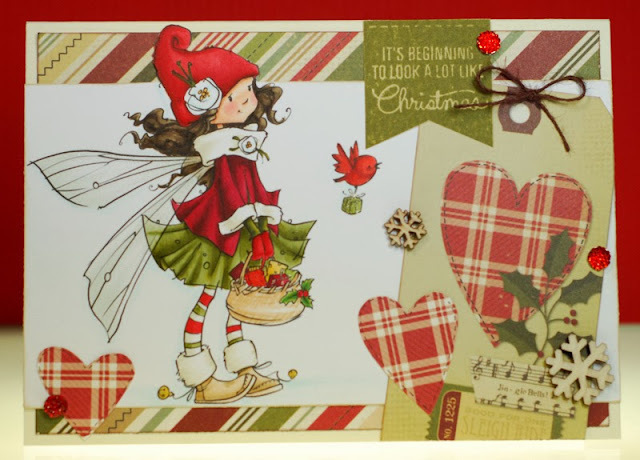 Pocket Birgitta along with the other December stamps and dies will be available for purchase at the CC Designs store tomorrow, Thursday, December 5th at 9am EST. 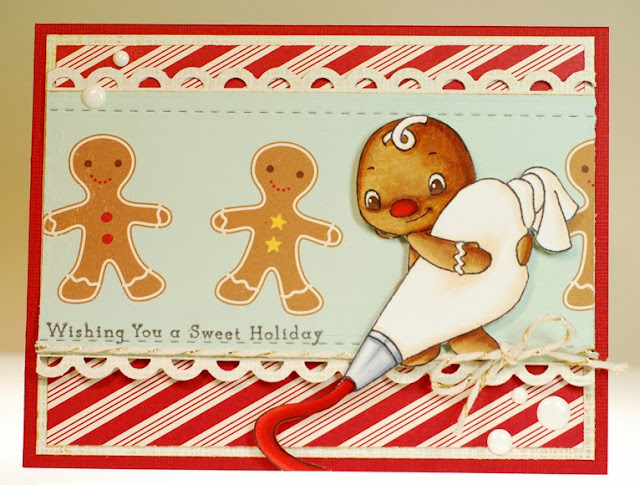 I don't have a card for the CC Designs preview today so instead I thought it would be a fun opportunity to revisit one of the newer Sweet November Christmas stamps... Gingy. I have a soft spot for these sweet little cookies... probably because I have a sweet tooth for the actual thing, LOL! 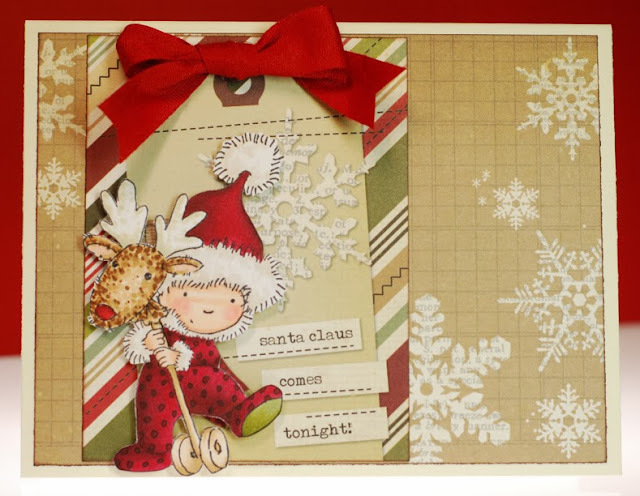 Today my card features a new Twila stamp from Roberto's Rascals called Snow Fun. This little girlie is zipping and zooming down any snow covered hill she can find. Because I wanted to make her work for a Christmas card using this sentiment, I went ahead and drew a tiny envelope for her to hold. Now Twila looks like she is rushing her letter to Santa to the post office so it gets to the North Pole in time. The rest of the CCD team have even more fantastic preview cards to share with you over on the CCD blog today. As always, there are chances to win the new stamps while you are there so don't miss that! Snow Fun Twila along with the other December stamps and dies will be available for purchase at the CC Designs store Thursday, December 5th at 9am EST. Anywho, I'm enjoying a day off today and tomorrow I'll be back with a CC Designs December preview... see ya then!